Coral reefs and associated ecosystems such as mangroves and sea grasses, are daily threatened by natural and anthropogenic factors, such as climate change (ocean acidification, sea level rise, coral bleaching), coastal development, overfishing, pollution and storms and hurricanes. Another major threat in ecological and economic terms are invasive alien species (IAS). The spread of the IAS can eventually result in losses of economically important species and endemism, as well as threats to the survival of local biodiversity. These threats to biodiversity also affect the ecosystem functions and the cultural and economic uses made of biodiversity by local communities. Two voracious species, Pterois miles and Pterois volitans (the last one is the most widespread in the Atlantic) known as "lionfish", are considered today as one of the greatest threats to temperate and tropical Atlantic reefs to happen in this century. The Lionfish is native to the South Pacific and Indian Oceans (i.e., the Indo-Pacific region). This native range of lionfish covers a very large area from western Australia and Malaysia east to French Polynesia and the United Kingdom's Pitcairn Islands, north to southern Japan and southern Korea and south to Lord Howe Island off the east coast of Australia and the Kermadec Islands of New Zealand. In between, the species is found throughout Micronesia. See figure 1. Fig 1: map of native range of Pterois volitans (green) and P. miles (blue) adapted from Schultz (1986) and Randall (2005). Star in Mediterranean Sea denotes Lessepsian migration of P. miles via the Suez Canal (Golani and Sonin 1992). Non-native range of P. volitans and P. miles in the Americas is shown in red (from Schofield et al. 2012). Predicted future distribution of lionfish along coastal South America is shown in red hatching (from Morris and Whitfield 2009). Lionfish are found in mostly all marine habitat types found in warm marine waters of the tropics. Lionfish have been found in water depths from 1 to 1000 feet (0 to 300 m) on hard bottom, mangrove, seagrass, coral, and artificial reefs (like shipwrecks). Lionfish are slow-moving and conspicuous, so they must rely on their unusual coloration and fins and on their poisonous spines to discourage would-be predators from eating them. Although lionfish are predated in their original range, few species, except large groupers such as the Nassau groupers, or some shark species, have been reported to feed on them in the Wider Caribbean. Lionfish are now one of the top predators in many coral reef environments of the Atlantic. Lionfish consume over 50 species of fish including some economically and ecologically important species . Lionfish are active hunters who ambush their prey by using their outstretched, fan-like pectoral fins to slowly pursue and "corner" them. 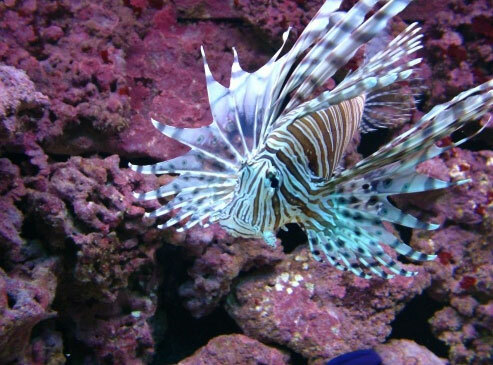 Although lionfish is a food source in their native range, economically, they are far more important in the aquarium trade. Lionfish are very popular and common aquarium fish, especially in the U.S. Lionfish are not currently listed as threatened or endangered in their native range. However, the increase in pollution in coral reefs may negatively affect the lionfish's primary food sources (crustaceans and fish). If lionfish are unable to adapt to declines in their prey species, their numbers may decrease.